Audiences won’t be able to catch their breath in this hilarious musical comedy of mistaken identity and wit. 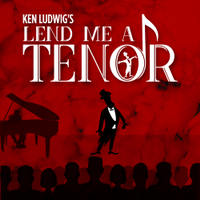 Lend Me a Tenor is one fun and energetic moment after another, it is sure to be a night of great fun! It’s the fall of 1934 and the Cleveland Grand Opera Company is excited to host the world-renowned tenor, Tito Merelli, in a one-night-only showing of Otello. It is sure to be a night to remember and, as it turns out, it is – for all the wrong reasons. After Tito is mistakenly tranquilized before the show, the cast and crew are thrown into a frantic and hilarious whirlwind, because, as we all know… The show must go on! Directed by Jennie Richardson it will be hard to pick just one favorite moment or song as these two casts go for broke in this delightful performance. Join us for a night of laughter and fun at CenterPoint Legacy Theatre. Reserve your tickets by calling the box office at 801-298-1302 or go online to cptutah.org. Lend Me a Tenor is sponsored by a generous donation from Cache Valley Bank Content Advisory This play is structured around the characters finding themselves in awkward and sometimes compromising situations due to mistaken identity and poor judgement. Innuendo and double entendre are included in the dialogue. Some adult situations suggested, but nothing graphic in nature. Younger children may find the physical comedy entertaining, but may not follow the dialogue comedy. PG, if rated on the movie scale.